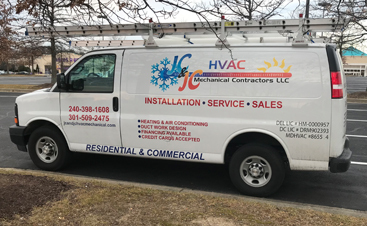 If you’ve stopped by JC & JC HVAC Mechanical Services looking for maintenance for your heating or air conditioning, you’ve made the right decision. 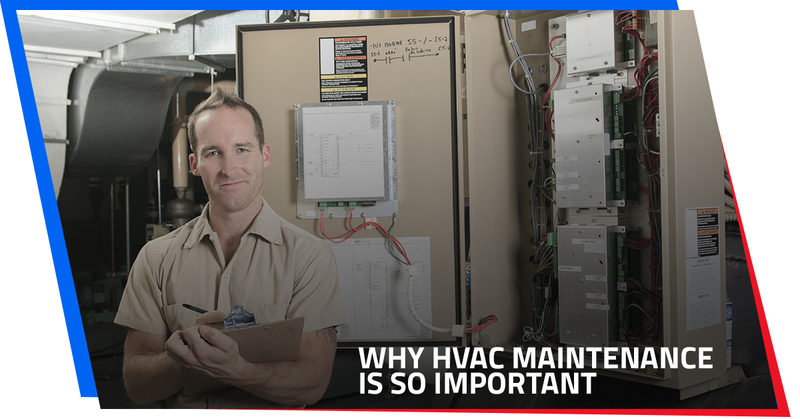 Far too many people put off their HVAC maintenance, and they end up paying for it in the end. Not only can delayed maintenance for your heating and cooling cost you a lot of money, but it can cost you time as well…and it could be dangerous. Keeping your HVAC system in proper working order and well-maintained is an excellent way to ensure that you won’t have as many problems in the future. We know how important it is because we’ve directly seen the effects of letting a piece of equipment languish without a proper tune-up. Not only is it less efficient, but it can also cause small problems to snowball. Why Is HVAC Maintenance Needed At All? While you might know that having a furnace tune-up or an AC tune-up is a good idea, you might have never thought about why it requires maintenance at all. The furnace was working perfectly fine yesterday, and this morning you’ve woken up to cold floors. One day the AC is working and the next you come home to a sweltering house. What happened to make them break? The fact is, heating and cooling is something we take for granted. While people once had to chop wood and keep the fire going to stay warm (and to cook, for that matter), today the most we have to do is adjust the thermostat…and most of the time we don’t even have to do that once it’s set! The HVAC in our homes usually works so well that it’s become invisible, which is the way it should be. So the only time we really ever notice our furnaces and air conditioners is when they suddenly stop working. It’s not just a coincidence that this often happens in the middle of the night or at the hottest part of the day, because the coldest and hottest temperatures put the most strain on a system. When the furnace or AC gives out, it’s very noticable. Because most don’t think about our HVAC very often, save perhaps when the calendar tells us to change the furnace filter, they also forget about just how complex they are. Like a computer, we don’t care how they work as long as they work. But also like a computer, furnaces and air conditioners are more complex than you might imagine. They are a combination of physically moving parts and electrical components. To complete the comparison, many pieces of HVAC equipment have computers in them! Unfortunately, a physical break in one component or a problem with the electronics can cause the entire system to fail. Even if the blower is still working, the lack of conditioned air becomes apparent very quickly. Much as you know that you have to have the oil in a car changed, you’ve probably heard throughout your life how important it is to get furnace and AC maintenance performed. Let’s take a look at the many reasons you’ll want to call for an HVAC tune-up. When thinking long-term, this is definitely the most important reason to a regular furnace and AC checkup. Just as cars need oil changes, it’s important to have an HVAC professional get in there and perform a regular tune-up. Cleaning is a big part of it, as is ensuring that the safety controls are working and that all electrical connections are tight. It’s also important to lubricate all moving parts so that there’s less friction to cause heat and wear. Is it really worth it in the long run? Yes. A furnace or AC unit that’s ignored is going to break down more often, causing more stress on the entire system. If proper maintenance can get you an extra five or even ten years out of your current system, that means you could end up buying one less replacement system during your lifetime! …prevents bigger problems in the future. It’s important to remember that there aren’t any “extras” in an HVAC system that you might get on other large purchases in your life. If the AC goes out in your car, you can roll down the windows and keep going. If the back window won’t go down anymore, no big deal. Heck, you could drive your entire life without needing washer fluid. There are so many components for both comfort and convenience in a car that you could lose 25-percent of them and the car will still get you where you want to go. HVAC units are a bit different. When something goes wrong with it, you’re going to notice because there’s not anything that’s ancillary; it’s all needed in order to keep you comfortable. Everything is connected, so fixing a small problem now could prevent strain and stress on a larger part. The $49 fix now could prevent a $400 fix in the future. While you might not think about it in this way, the primary purpose of a forced-air HVAC system (the most common type in the country) is to move air from one place to another. The air is either heated or cooled and then moved through the ductwork to various parts of the building. Dust can get into a home in a variety of ways. It might blow in through the window. It might be carried in as mud on someone’s shoes, only to dry and be broken apart to be turned into dust. Dust is also made from decomposing textiles such as furniture and carpet, and yes, some of dust is indeed human skin. One important benefit of having regular AC and furnace service performed is that the unit is thoroughly cleaned. For instance, on a gas furnace the burner assembly, ignition assembly, heat exchanger, filters and blower components are all cleaned. Cleaning isn’t just about making things look nice or reducing the amount of dust in the system. When furnace and AC maintenance are performed, the system will work more efficiently because it doesn’t have to work as hard to overcome the dirt that’s gumming up the works. A system that’s clean is using less energy, experiencing less wear and tear, and costing you less money. In the middle of winter, we’re sure you don’t want to wake up to a freezing room and the realization that today is the day you need your furnace or boiler repaired. It often happens on one of the coldest nights of the year, and you know that you’re going to have to call into work and take the day off while you call for emergency HVAC services. After all, you don’t want the pipes to freeze. When you have heating maintenance performed, you’re simply not going to have as many emergency furnace fixes. Think about it: wouldn’t you rather schedule heating maintenance and instead of having to contact a 24/7 HVAC company? Now don’t get us wrong, over the course of 20 years in a home a middle-of-the-night breakdown is going to happen eventually. Parts of your furnace or air conditioner are going to give out on you, and you’ll have a few of those mornings over the course of your time in the house. But having regular HVAC maintenance performed means that you’re bound to experience fewer of them over the years. One of the things we check during our HVAC tune-up is the thermostat. Problems with the thermostat can reduce the efficiency of a system, which is why it’s so important to ensure that it’s still working as it should. If a thermostat is causing your system to be less efficient, you might not know until you have a breakdown. When you get regular HVAC tune-ups you’ll get the problem fixed sooner, even if it was a problem you didn’t know existed. What could be wrong? It could be that the wrong type of furnace filter is in place, or the foundation shifted and pushed the entire unit out of whack. Or it could be something big in the vents, which isn’t unheard of even if the prospect is too scary to think about. The important thing is that the problem is identified so that it can be fixed accordingly. One of the most important safety services we perform is to check for gas leaks. Sometimes a hose might be banged out of place while you’re working in the furnace room, causing a low-level and nearly undetectable gas leak that could cause a fire hazard or be the source of unexpected headaches. After all, that air and the gas it contains are being circulated throughout the building. Another problem that arises with gas furnaces is a cracked heat exchanger. When this occurs, the natural gas used for heating isn’t converted into heat as efficiently, meaning that the dangerous gas is pumped into the house. Headaches and nausea are two of the most common symptoms, but it can turn deadly if it gets worse. We’ll check for any signs of cracking, but we must remind you that you should always be sure to have carbon monoxide detectors in every bedroom. We’ve gone through the many reasons that the largest appliances in your house can give out. They’re complex machines, and eventually the moving parts are going to lose microscopic bits of metal until they eventually fail. The electrical impulses that move through other parts cause their molecules to eventually weaken and give out. Entropy breaks everything down eventually. So what’s the most likely scenario when it comes to a household appliance failing? What are the most common reasons that people call us for HVAC service? Here are the problems we encounter. Dirty Filters – While most people will perform their own furnace filter changing, some just never get around to it. A dirty or clogged filter will always reduce the efficiency of a system, but one that is overly-full can lead to a system working so hard that a particular part just gives out. Ignition Problems – Whether you have flame or spark ignition in your gas furnace, the constant heat or electricity (which also causes heat) to the ignition hardware could eventually cause it to fail. Blower Problems – The basic idea behind a furnace is pretty simple: create hot air and then blow it through the ductwork. If basic wear and tear have caused the fan to break down, you’re not going to get the heat through the house as it should. Leaking and/or Dripping – You won’t be surprised to know that a leaking boiler is not a good thing, no matter where it occurs in the system. There could be broken seals or valves, as they can become worn out over time due to heat and submersion. Strange Noises – One of the reasons that many people prefer boilers is because they tend to be quieter than forced-air units. So when the boiler starts making strange noises, customers are likely to call. Noises can mean that the system has lost water for some reason, or that there’s air in the system. Strange noises should always be investigated to see if there’s a bigger problem on the horizon. Refrigerant Leaks – If your air conditioner no longer contains refrigerant, it has no way to cool your home. In most cases the fan will still be running, but all you’re getting out of your vents is warm air. 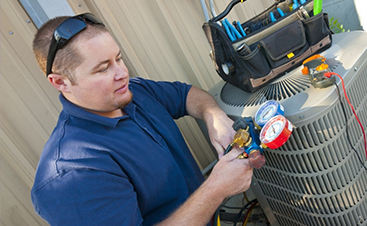 You’ll need professional AC service to not only fix the leak but also to replace the refrigerant. 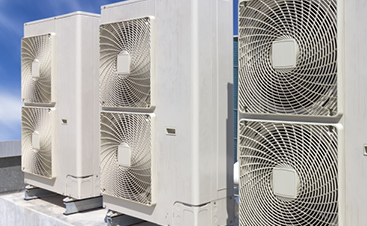 Problems with Condenser Coils – The evaporator coils are one of the most important parts of the system. They might simply be dirty, causing the system to work inefficiently. But if they are too dirty or corroded, the entire system might become overworked. Electrical Problems – If you stand next to the outdoor unit of the air conditioner, you might be startled when it turns on. Part of what you’re hearing is the startup of the electrical components such as the motor. Anything that has electricity running through it can eventually break down because of the extreme heat electricity puts on its components. Exposed ductwork gets bumped, especially in the furnace room as people are storing items. Ensuring the ductwork connections are in good shape can increase the entire HVAC system’s efficiency. Houses settle over time. Either the foundation moves the furnace or the house frame shifts and moves the ductwork. Either way it’s a good idea to have a professional take a look at the ducts. Ductwork can get filled with dust, leading to inefficiency in the system as the dust disrupts the airflow. A professional duct cleaning service can be called in to clean them out, which can help those who suffer from allergies from the pollen that gets stuck in the ductwork. How Often Should HVAC tune-ups Be Performed? Considering that a new HVAC system will cost $4000 or more, you’ll want to make sure to spend a little money in order to keep it in the best condition possible. Every HVAC company we know suggest two tune-ups per year, one focusing on the AC and one on the rest of the HVAC unit. For less than $200, you can make sure your heating and air conditioning will be there for you throughout the entire year. Click here to take a look at our maintenance contract and the 18 tune-up steps we take to ensure your HVAC system is problem-free. Contact JC & JC HVAC Mechanical Today! We hope we’ve convinced you that taking care of your HVAC is a good idea. After all, your heating and air system is a part of your house, built in and difficult to replace. If basic HVAC tune-ups save you just one furnace replacement during your lifetime, they will certainly be worth it. If you have any questions or are ready to schedule an appointment, all you have to do is click here. We work with HVAC equipment all day, every day, and would love to talk to you about your current situation.